The second season of Amy Sherman-Palladino’s show is stuck in its comfort zone. Much like a B. Altman’s holiday window, or much like Miriam herself—who, later in this episode, wears a raspberry swing coat that may or may not have literally made me salivate—The Marvelous Mrs. Maisel is always perfectly arranged. 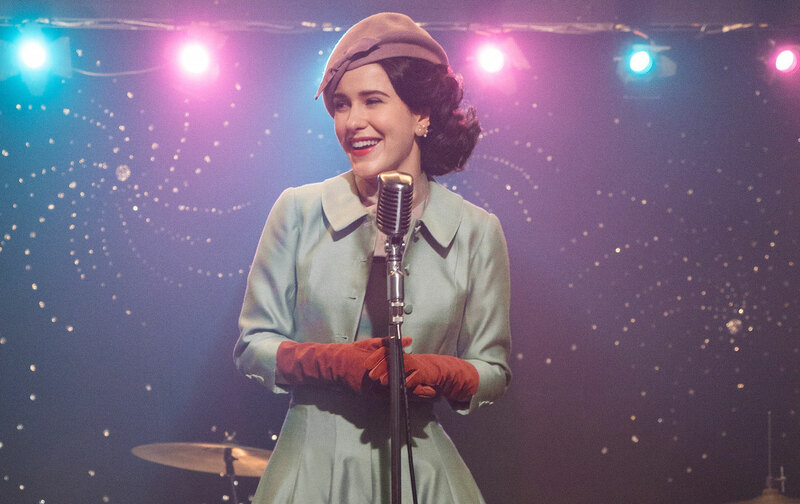 Created by Amy Sherman-Palladino (Gilmore Girls), Mrs. Maisel is one of the most gorgeous shows on any platform right now. The resources that Amazon has poured into the project allow for dazzling camera work, a candied palette, and intricate sequences—like the one above—as delicious as a cherry cordial. It’s nostalgia enrobed in spectacle. The show is as hardworking and eager-to-please as its heroine, and this may also be its biggest weakness: In episodic narratives, there are few things more enticing than the prospect of watching someone torch their own life, then try to understand who they are without the roles—obedient daughter, perfect wife—that have always defined them. But Miriam is still someone who rarely has to struggle. She is good at nearly everything she tries, quicker and brighter and more dedicated than anyone else; the word that best defines her is most. And the sweet sitcom chaos of the show’s plots often shields its characters from having to face the smoldering wreckage of their emotional lives. Way back in the pilot episode, Lenny Bruce (Luke Kirby) appeared like an angel of radical honesty, watching over Miriam’s first turn at stand-up comedy, and so, too, over her first experience of showing the world her raw and real self: Her first time performing was her first time not performing. The Lenny Bruce character has remained part of the show’s ensemble in a way that has little to do with the needs of the story, and a lot more to do, perhaps, with the world Lenny beckons Miriam to join—a world that is diametrically opposed to the only one she knows, where she is, like Dolly Levi, a woman who arranges things, and who does everything for everyone and needs nothing for herself. You can have the pain of telling the truth, the show’s twin Jewish saints seem to say, or you can have the pain of hiding it. There is no painless path. All you can do is pick the pain you believe you are able to stand. But Miriam doesn’t want to choose, and neither does the show that bears her name. Choosing the pain of self-exposure—of destruction, of rupture—might mean that the marvelous Mrs. Maisel would have to stop being quite so marvelous. The Marvelous Mrs. Maisel wants to be comfort food, but it can’t resist plying viewers with sugar. The series has the production values of a prestige drama, but its poppy energy and whip-crack dialogue—the kind that fans of Gilmore Girls remember well—mean it is missing something that can be difficult to identify: silence. Rarely does a character have time for a moment of contemplation; rarely does a conversation pause or even slow down much. Characters talk to each other—and over each other—in the contrapuntal rhythm of vaudeville; each partner in a conversation appears to believe the other is their straight man. Even in their most private moments, they are playing to an audience. In the first episode of this new season, Miriam’s mother, Rose (Marin Hinkle), flees her marriage for a bohemian existence in Paris, telling her husband, Abe (Tony Shalhoub), that she no longer sees meaning in her life. When Miriam discovers Rose’s disappearance, she and Abe track her across the globe, their journey accompanied by a series of conversations in which they are presumably meant to seem frantic, frightened, and emotional—but the show never really allows Abe and Miriam to veer into actual discomfort. Every exchange feels like a slalom race, with the characters careering from punch line to punch line, and most of the jokes, rather than being revealing, come across as if they were arranged for the comfort of the audience, and for that of the characters, too. As long as you can be funny, you can be in control; as long as you’re talking, you don’t have to listen. Since Miriam is called away to Paris early in the episode, the viewer only sees her and her booking agent, Susie (Alex Borstein), share a handful of scenes. Some of the show’s most emotionally raw moments have come courtesy of Miriam’s relationship with Susie, as well as with Miriam’s former, perfect husband, Joel (Michael Zegen)—yet, somewhat tellingly, in this first episode of the new season, she maintains a safe distance from them. In fact, out of every character on the show, the one who seems most interested in actively trying to understand himself and his relationships is Joel, the mediocre Mr. Maisel. As Miriam explores Paris, we follow Susie on her own picaresque adventure: Kidnapped off the street by a pair of heavies, she ends up charming them out of their mission to do their boss’s dark bidding, for now. On this show, the chickens have a hard time coming home to roost. It’s hard to hurt people you love; it’s also hard to watch characters you love be hurt, hard to watch them suffer the consequences, hard to watch them change, and perhaps become less lovable. And it’s hard to make viewers uncomfortable when you know, as Amy Sherman-Palladino knows well, what will make them feel pampered and delighted.